3 out 4, brilliant start for Europe! 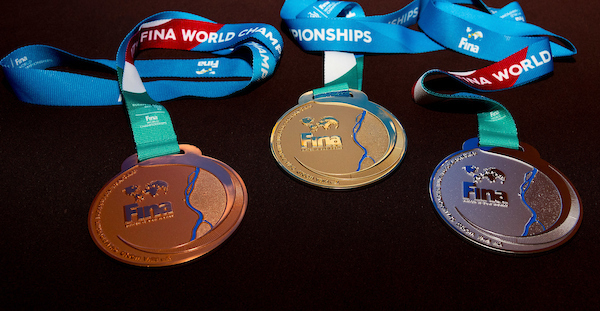 European athletes couldn’t have had a better start for the 17th FINA World Championships in Budapest. Three titles in three disciplines (out of the four on offer on Day 1), what a beginning! All medals remained in our continent after the men’s 5km race, Russia’s Ilya Zakharov and Evgenii Kuznetsov pulled off a miraculous win over the Chinese in the men’s 3m synchro in diving while Svetlana Kolesnichenko triumphed in the solo technical routine in synchronised swimming. After a truly amazing Opening Ceremony on Friday evening, the first real competition day saw a grand opening for the Russians. While Svetlana Kolesnichenko maintained her nation’s dominance in synchro, Ilya Zakharov and Evgenii Kuznetsov produced a huge upset by finish first, ahead of the Chinese. Kolesnichenko proved to be a worthy successor of the wonderful Natalia Ishchenko as she showed a very convincing performance in the solo technical final. This event saw a European 1-2-3 as Spain’s ever-young star Ona Carbonel came second and Ukraine’s Anna Voloshyna earned the bronze. In fact, the championships were kicked off with an all-European podium in the men’s 5km race in open water swimming, held in the magnificent Lake Balaton. The first title – chronologically this event offered the first gold of the Worlds – went to Frenchman Marc Antoine Olivier who prevailed in a tight finish over Italy’s Mario Sanzullo. Britain’s got the bronze, courtesy of Timothy Shuttleworth – European dominance was further underlined by grabbing seven of the top eight positions. Back to Budapest and to the main site the Danube Arena, the first diving gold landed in China as it was expected. In the mixed 10m Team GB opened its march with a silver, Lois Toulson and Lee Matthews produced their best dive when it was really needed, in the last round. What came next was somewhat historical since the Chinese failed to win gold in connecting events. Their entrant, Chen Yiwen didn’t even make the podium in the women’s 1m, here Aussie Maddison Keeney clinched the title while Russia’s Nadezhda Bazina got the silver, ahead of Italy’s Elena Bartocchi. The day ended with the Russian duo heroic performance, Zakharov and Kuznetsov left all their demons behind and finally could make it to the top of the podium. The last occasion the men’s 3m synchro title eluded China dates back to 2003 – now the day’s best attempt earned the title for the Russians. This 100-pointer rocketed them to the top (they never led in the final, just in the last round) and the Chinese couldn’t respond to that. The bronze also stayed in Europe, thanks to Ukraine’s Oleg Kolodiy and Ilya Kvasha who managed to overtake the Olympic champion pair of Chris Mears and Jack Laugher. A bit surprisingly they had to settle for the 4th place after they had a poor dive in the penultimate round which also saw the Chinese faltering.